When the postman handed me this incredibly heavy Glossybox* I had absolutely no idea what would be inside. As I opened it and saw the special edition design & Harvey Nichols logo everything began to make sense. 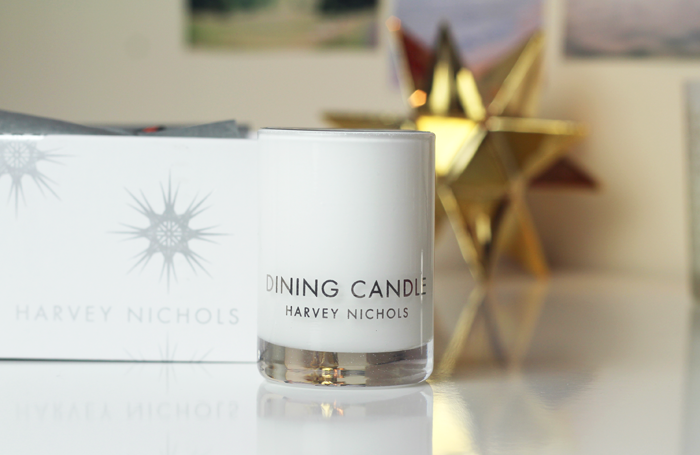 This season Glossybox have teamed up with Harvey Nichols to put together a box that aims to celebrate Christmas in style. This is a special, limited edition box separate to their usual subscription service that will be available to purchase from November 17th while stocks last. 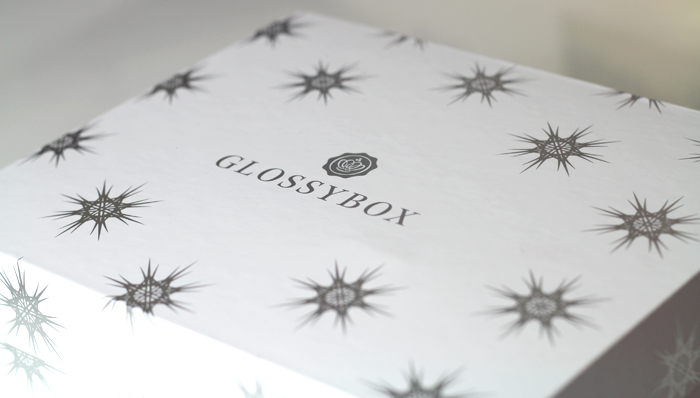 It's available to existing Glossybox subscribers for £30 and the non-subscriber price is £35. The contents are worth over £150 and include lots of well known high-end brands that can be found in the Harrods beauty hall. 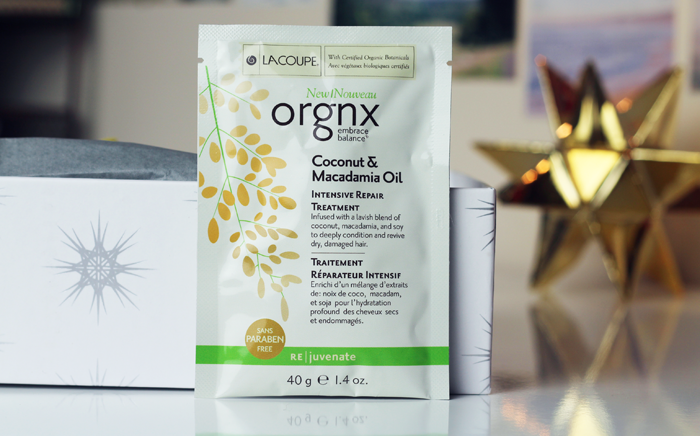 Could be the perfect gift for that special someone that loves to try out new beauty products, or even as a gift for yourself because treating yourself too this Christmas is more than okay! 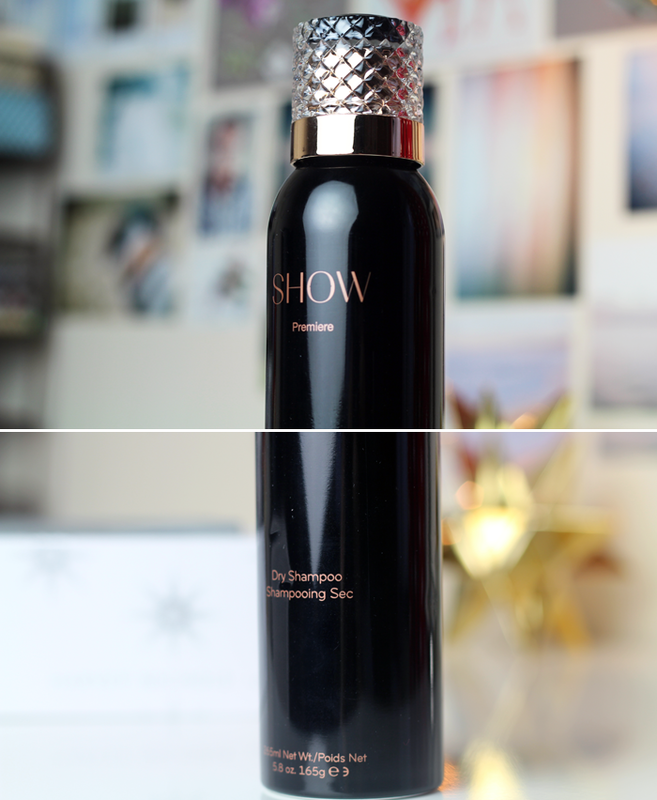 If you enjoy trying high-end hair products, the full sized SHOW Beauty product is worth the cost of the box alone. Dry shampoo isn't the most exciting thing in the world but the packaging is lovely and I must say that it smells amazing. There's also a full size OPI Nail Polish in a beautiful purple that's not too dissimilar to the Cadbury's packaging. I think it would look stunning with a gold glitter over the top or as an accent nail. 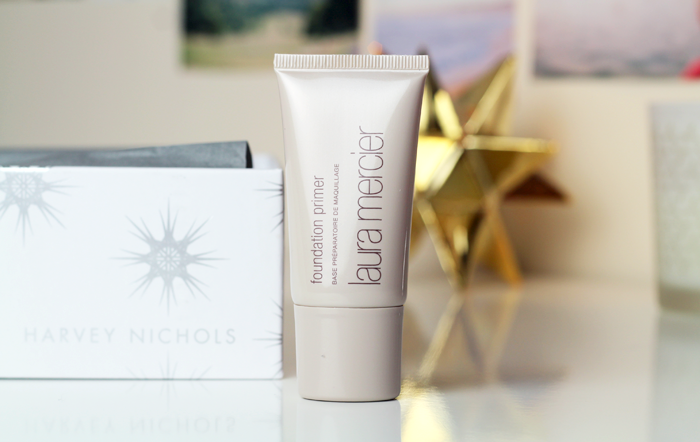 The Laura Mercier Foundation Primer is a fabulous little product and it's a really good 30ml size. 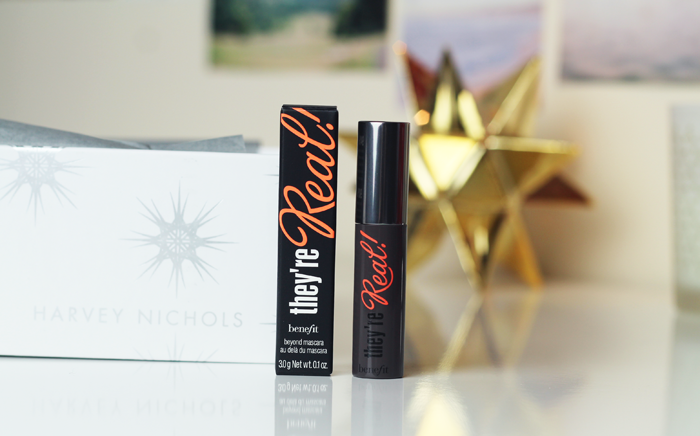 The miniature Benefit Mascara will be a big hit because I know it's well loved by so many people. 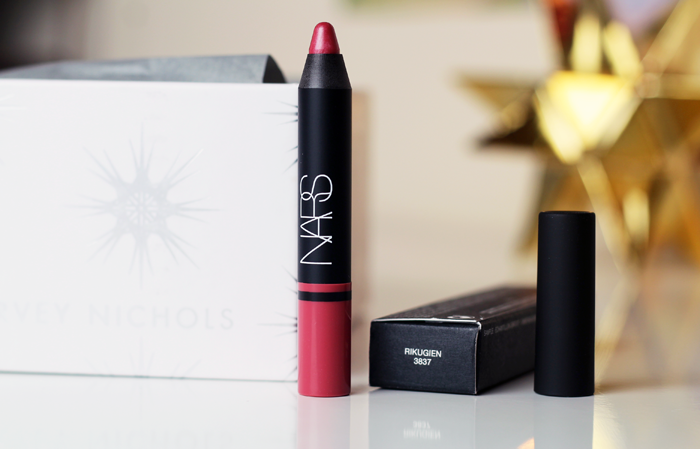 My favourite product in the box is the NARS Satin Lip Pencil because I've never tried them before and the colour is a really wearable muted neutral peach. Difficult to explain, but very pretty and I think it would suit most skin tones. I think that this is a very well curated box and it certainly feels like a little touch of luxury. 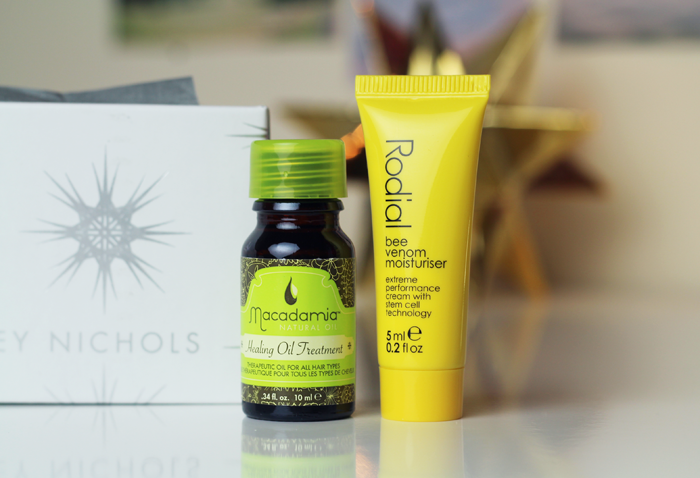 Although there are a couple of fairly small samples like the Rodial Bee Venom Moisturiser and the Dermalogica Serum, they're from high-end brands with high-end price tags to match. 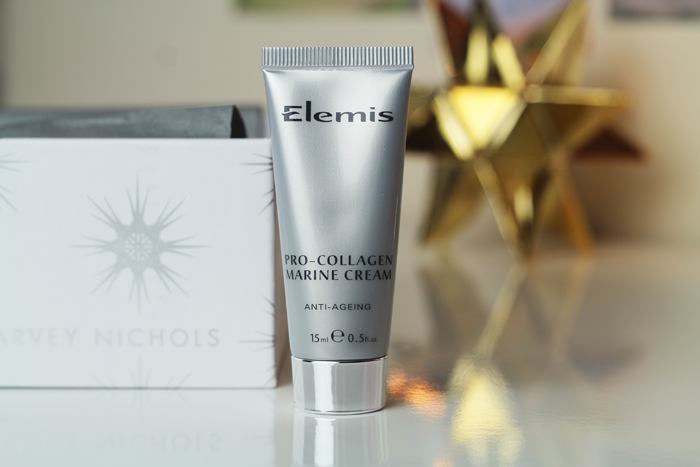 I'm not usually one for wanting to try super expensive things for fear of falling in love with them and not being able to repurchase, but sometimes it's nice to try them and feel extra special, especially over the festive period with lots of Christmas parties and family gatherings. 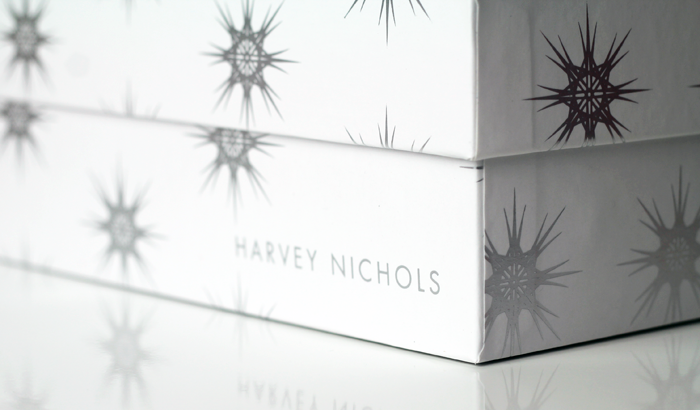 What do you think of the collaboration between Glossybox and Harvey Nichols? Impressive, or is it missing anything you would have liked to have seen in there? Ahhh this box is tempting me! I don't know whether to cave or not! Oh wow, what a lovely box!! :) I haven't tried that particular Bee Venom product but the serum is great! This looks like an absolutely amazing beauty box! The fact that there is a NARS Satin Lip Pencil instantly has me won over and I love the look of the Laura Mercier Foundation Primer and the beautiful Harvey Nichols candle! :) There are some stunning shades included! This is the kind of box that could actually tempt me to finally sign up for a beauty box again! Some lovely products and a lot of them are ones you don't usually see in other beauty boxes which really interests me! Looks like a fantastic Christmas gift for someone! The products look great in this box! The products look great. I think it'd make a good Christmas present for someone beauty mad but not sure I would get it for myself as there seem to be a few repeats of things I've received in beauty boxes during the year. This is a really lovely box I have to say. I've never seen such a nice beauty box. This looks like an amazing box and definitely worth the money for how much you get! I'm just struggling to comprehend a £30 dry shampoo... Madness!! 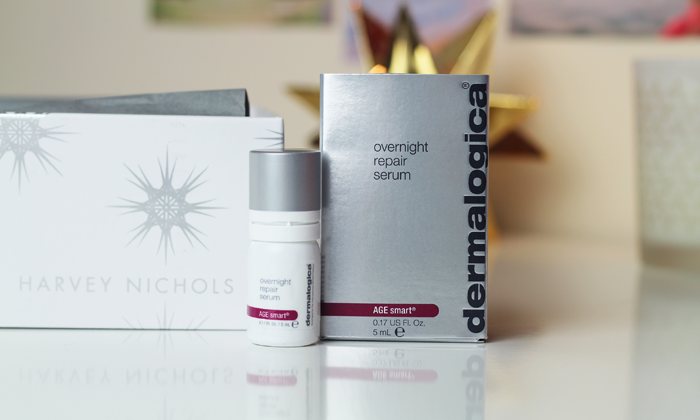 This is defiantly a good collab, and this reminded me how much I like Dermalogica skincare!